Well I won’t say it takes very much to teach this old dog a new trick but after tripping and landing on my right knee breaking it into 3 pieces I still wasn’t ready to give up my flip-flops! It wasn’t too long after that, wearing flip-flops, when it was raining and walking up a cement incline that I slipped and fell on my left knee which would lead to an infection swelling up the ankle and itching like crazy! I had to have about 5 ultra sounds regarding both injuries and each technician doing the exam told me that they see more injuries due to flip-flops than most anything else. Add to that both my primary doctor and vascular surgeon advising me, very strongly, to stop wearing them that I finally decided it was time to do just that. I sort of compromised and bought an expensive pair of flip-flops as sort of a half way measure and then did it—I got a pair of sandals. 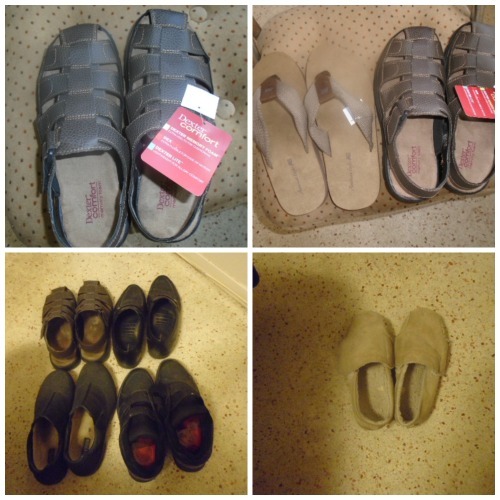 I was about to go on a sandal binge when I realized that I had 3 pairs of ‘dress’ shoes that I had alternated wearing to the theatre over the past 5-6 years to about 96 plays averaging maybe wearing each pair 5 times a year so I now had 4 pairs of shoes that I could wear changing a pair every day. 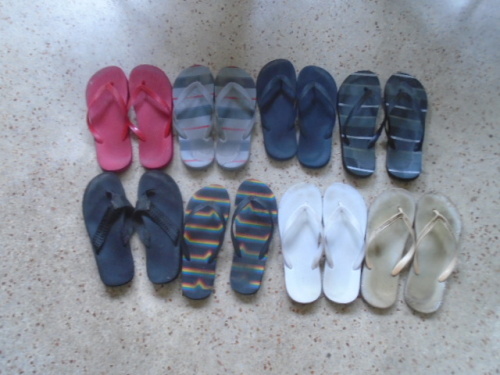 Right now they are all in good shape so I will have to see how much wear and tear they take under normal conditions. I do have a pair of slippers to wear around the house plus it is pretty safe for me to walk around the apartment barefoot as I don’t have any throw rugs, etc., on the floors except for one to cover wires in a hallway and a couple in the bathroom where I am barefoot anyway. I think it was in 1981 that a podiatrist diagnosed me as having a hairline fracture in each heal and prescribed me ‘safe’ insoles to wear in all my shoes and I have had them ever since but it is only recently that I am wondering if that diagnoses was right. I have a podiatrist’s appointment at the end of the month and I just might ask her to check it out!